In the spring of 2008, while my husband, Richard, was attending seminary in Louisville, Kentucky, I discovered I was pregnant with our first baby. While he was gone for the day, I painstakingly planned how I would reveal the wonderful news. That evening, we enjoyed a delicious dinner, followed by a cake iced in baby blue and pink. We then sat down to a favorite Jimmy Stewart movie in which his character’s wife also plans a special announcement. 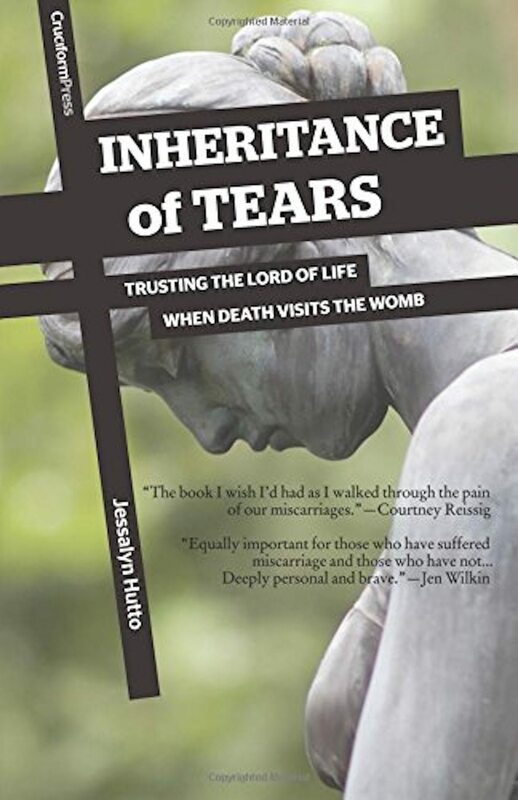 As I cracked open Jessalyn Hutto’s small book, Inheritance of Tears: Trusting the Lord of Life When Death Visits the Womb, these words brought a surge of grief. Not only did I know what was coming intellectually—this is, after all, a book dealing with miscarriage—but I also know personally the sharp 180-degree turn from joy to heartbreak. Like Hutto, when I went for an early ultrasound “the baby’s tiny form was there, but the reassuring sound of a heartbeat was missing.” A little over halfway through the first trimester my baby’s heart had stopped beating; two weeks later, I joined the ranks of so many who have experienced the pain of miscarriage. Cruciform Press. 108 pages. $9.99. In this paragraph Hutto answers the ubiquitous why of our grieving hearts. Something most definitely isn’t right, and that something is sin. Our expectations for ease betray the fact we aren’t fully aware of the far-reaching results of the fall. As Hutto observes, “Rarely do we consider the awful truth that our babies are conceived in sin-infected bodies walking around in a sin-infected world” (31). So the grief of loss jolts us into a difficult reality: the results of sin are inescapable. In the days following my miscarriage, I felt hopeless. The future I’d imagined with this child would never be. This August, I didn’t hold a newborn in my arms. I did not smell that little tuft of hair, kiss those rosy little cheeks, rub those plump little hands. In the death of that future, though, another began to shine even brigher—a future beyond motherhood. Because of Christ’s pain, he sympathizes with me in my pain and calls me beyond it—to the hope his suffering purchased for me. Miscarriage is just one devastating expression of the sin-soaked grief Christ arrived to eradicate for his precious bride. The death of miscarriages, too, shall die upon Christ’s imminent return. I wish I could’ve read Inheritance of Tears during those initial days of realizing my baby had died. I was blessed to read it shortly afterward. In this book I not only found the words for what I was feeling, but also the tender, heartfelt gospel reminders from the heart of a woman who understood the pain I’ve experienced. And not only does she understand, she points me beyond the experience and to the broader gospel story. Although not bluntly articulated in the book, the themes of creation, fall, and redemption are shouted from each page. Inheritance of Tears is a rare attempt at handling a difficult subject so few dare to address. Instead of offering trite or saccharine comforts based on warm fuzzies and false promises, Hutto offers deep and transcendent truths that tackle the questions so many women have been called to wrestle with. As I read the prayers at the close of each chapter, I felt comforted and guided by a sister in Christ. Through pressing this book into the hands of other hurting sisters, we may have the opportunity to point them to the only answer for each and every grief they bear. Are We Asking Too Much of Our Birth Stories?